The 2nd grade EXPO students at L.A. Nelson want to make a difference in the world we live in! 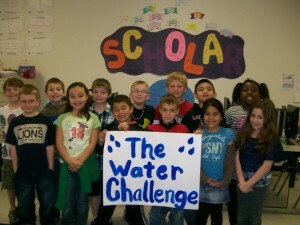 We are hosting a school-wide Water Challenge to help bring awareness to the importance of access to clean water. We are hoping to raise $3,000.00 to pay for half of a well in a village that needs it. 03/05/12 Angel Rogers $15.00 What a great opportunity to care for others. 03/03/12 Matthew Cline $20.00 I am honored and humbled to give kids something we take for granted everyday. 02/29/12 Melissa Matthews $100.00 I am honored to be able to play a small part in such a worthy cause.